Knoco are currently conducting a global survey of Knowledge Management approaches and trends. 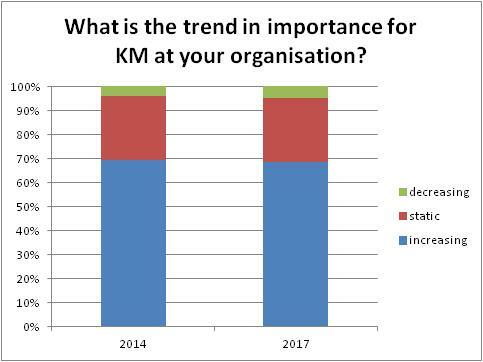 The survey is a re-run of one of the most comprehensive surveys of global knowledge management ever devised, conducted in 2014, and the results from the current survey will help show what has changed in KM in the past 3 years. The current survey remains open until the weekend; if you would like to take part. According to a quick look at the results that are coming in, the answer to "what has changed in KM" seems to be "nothing much", at least as far as trends in KM importance are concerned. 3.9% in 2014 and 4.8% in 2016 saw the importance of KM as decreasing. The often-reported "death of KM" is greatly exaggerated. Just under 70% of knowledge managers worldwide see KM as on the rise. Only 4 or 5% see KM as on the wane. There has been no statistically significant change in these figures over the past 3 years. The rise of KM seems steady. Feel free to take the survey now if you would like access to the full report, or would like to add your own datapoint. You have until Sunday before the survey closes.